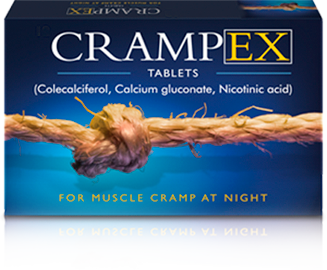 Crampex is the only over the counter product available which is licensed to help both prevent and treat painful nocturnal muscle cramps. Crampex uses a unique triple-action formulation, containing calcium gluconate to help correct any calcium deficiency, cholecalciferol to aid calcium absorption and nicotinic acid to improve poor peripheral circulation. Crampex is available in pharmacies nationwide. It is recommended to go see your doctor if nocturnal cramps persist or symptoms worsen, or the tablets have not taken effect within a week of starting treatment.